China Southern Airlines is majority owned by the Chinese government. China Southern Airlines is Asia’s largest airline in aircraft fleet size. The international (and domestic) hub for China Southern Airlines is Guangzhou Baiyun Airport and it also operates some international routes from Beijing. China Southern Airlines is a member of SkyTeam Alliance, and the only operator of the Airbus A380 in China. China Southern Airlines has a large aircraft fleet (Asia’s largest airline in aircraft fleet size), and long haul international flights are normally operated by Airbus A380, Boeing 787, Boeing 777-300ER aircraft and Airbus A330 aircraft. The main airport used by China Southern Airlines is Guangzhou Baiyun International Airport, located in southern China, and the 2nd busiest airport in China. The airport is located approximately 28 kms from downtown Guangzhou, and the easiest transportation option is to use a taxi or one of the Airport Express buses. In Beijing, China Southern Airlines operates domestic and international flights from Terminal 2. Check in service is at a good standard in Guangzhou Airport, and there are many self-serve check-in facilities, together with Sky Priority services. China Southern Airlines also has a separate Premium check in lounge for First and Business class international customers. China Southern Airlines international First and Business class lounge at Guangzhou Airport is spacious and modern, arranged over 2 floors with a relaxing area and shower facilities located on the upper floor. Lounge catering standards are good, with a seated restaurant area and live cooking station serving freshly prepared dishes. WiFi is available, although speeds mirror many Chinese airport standards by being slow. China Southern Airlines have applied a lot of attention in recent years to developing and improving the transfer process through Guangzhou Airport for international flights, and this now offers a reasonably easy exercise without long delays. The international departure gates area at Guangzhou Airport do not offer much in the way of facilities for transfer customers, and be warned that food and beverage options are limited and very expensive! The domestic First Class lounges at Guangzhou Airport are very modern and well presented, and these meet a good standard. Facilities offer comfortable and pleasant waiting areas. On international flights, China Southern Airlines offer First class, Business Class, Premium Economy and Economy class on their aircraft. Domestic flights normally offer a Business Class cabin, several rows of Premium Economy seating and a main Economy class cabin. The new Boeing 777-300ER and Airbus A380 aircraft provides seat pod style flat bed seats, in a 1x2x1 layout, with seat cocoon style flat bed seats on Boeing 787 and Airbus A330 aircraft. The seats are spacious, offer good privacy and there is a large IFE screen. A nice duvet and pillows are supplied, and staff are efficient at providing a turndown service. The onboard catering meets a good standard, with a wide choice off both the Chinese menu and Western meal options. A good choice of wines are available. An amenity kit is provided, slippers and nice pyjamas (it is advisable to select the largest size for comfort). Cabin staff service is generally very good, most cabin staff have a good understanding of English, and staff language skills are improving year on year. You may of course find that some staff will not understand if you go off-script, but fellow staff are always able to assist. The choice of reading materials is reasonably good with English language Chinese and some destination titles of newspaper offered, and a selection of English language magazines. The IFE system is good on International aircraft, and a choice of Western movies is offered, as are Western TV programmes. China Southern Airlines widebody aircraft offer flat bed seats / seat pods, arranged in a 1x2x1 layout on Boeing 777-300ER. There are flat bed seats on other aircraft, some arranged 1x2x1 and others a more conventional 2x2x2. A nice duvet and pillow are provided. Pyjamas are not normally supplied, but you receive an amenity kit and slippers. The onboard catering is quite similar to First Class (some service and presentation differences), with a good mix of Chinese and Western options. Cabin staff service is efficient and normally to a friendly and courteous standard. The IFE system is patchy, and you may find that the responsiveness is very slow. The choice of reading materials is reasonably good with English language Chinese and some destination titles of newspaper offered. The IFE system is good on International aircraft, and a choice of Western movies is offered, as are Western TV programmes. China Southern Airlines Economy class seats provide a reasonable standard of comfort, with an average seat pitch and legroom. For the Cabin Seat Layout plans, we suggest you refer to our Airline Seat Plans guide where you can view China Southern aircraft cabin layouts. A blanket and pillow are provided, both of which are good quality. The Economy class onboard catering is meeting a good standard, with a choice of Chinese and Western meal options. Chinese tea is served with the meal and you may have to ask if you want to get a beer or wine served – it is worth specifically asking for this to be served chilled. The cabin staff are quite enthusiastic with a pleasant demeanour. They are trained with standard English language phrases, and you may find that some questions you ask confuse them, but persevere and they normally get a better English speaking member of staff to help. The IFE system is good on International aircraft, and a choice of Western movies is offered, as are Western TV programmes. 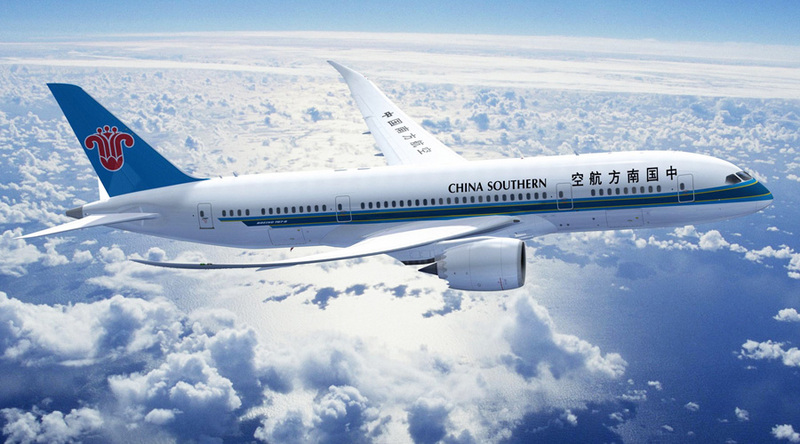 The majority of China Southern Airlines domestic flights are operated by narrowbody Airbus A320/321 and Boeing 737 aircraft types, although some routes may use Airbus A380, Airbus A330 and Boeing 787 aircraft. The onboard narrowbody product is divided by Business Class seats configured 2×2, a few Premium Economy seat rows and standard Economy 3×3 seating. A meal or snack is normally served, subject to flight duration. Some flights offer IFE programming and a tablet loaded with TV/movies is offered in Business class where there is no in-seat IFE system. It is worth remembering that there are clear cultural differences amongst many Chinese travellers, and some of these may be disconcerting to western customers. This is an area that the Chinese government has been trying to address in recent years, and in 2013 the China National Tourism Administration published a 64-page Guidebook for Civilized Tourism (encouraging better manners). As far as air travel is concerned, you are likely to notice that queuing is often disorderly and when for example flight boarding is announced, there can often be a rapid stampede of travellers pushing and shoving to get through the gate quickly. Loud talking (almost shouting) is another trait you might find disconcerting both on the ground and onboard flights. Spitting remains an issue despite educational promotions to stop this. Despite airline’s best efforts to keep passengers seated after landing, you may also find a number of passengers standing up to retrieve luggage whilst still taxiing. We guess that bit by bit such practices will gradually improve in coming years, but don’t forget there are 1.4 billion potential Chinese travellers. China Southern Airlines is the best of the three government controlled airlines in China (Air China, China Eastern and China Southern). A lot of progress in both product and service development and improvement has been made during the last 5 years at China Southern Airlines, and it becoming a more recognised name on the international stage. They often provide competitive fares, and on this basis we would recommend them as an airline to try.